To date, BCM materials have been translated into more than twenty-five languages such as Swahili, Bangala, Hindi, Burmese, Spanish, Portuguese, Russian, Ukrainian, Romanian, and Bulgarian, with new languages being added each year. Join our team of publications staff around the world! 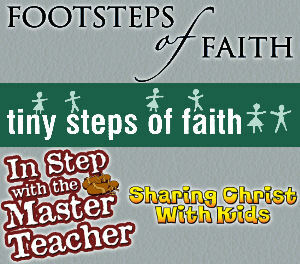 Our flagship curriculum, Footsteps of Faith, is an eight-volume curriculum, designed for children ages 6-12, that presents the Bible chronologically from Genesis to Revelation. Its aim is to enable children to come to know God personally, to love God unreservedly and to obey God completely as they learn to walk in the footsteps of faith and obedience. Each volume includes complete Bible lessons, colored flannelgraph visual figures and a unique review system, all of which are built around a central theme. Related resources include creative teaching and memory work ideas, take-home colored Bible verse tokens (KJV and NIV), daily Bible study helps and a menu of related program ideas. Our preschool curriculum, Tiny Steps of Faith, designed for ages 4 and 5, is a Bible-centered, activity-oriented curriculum that lays a foundation of Bible truth for young minds. Each of the 4 volume includes Bible teaching presented with colorful plastic figures placed on a plastic Stick-on Storiboard. Each lesson includes interest centers, songs, prayer, simple Bible memory work and a weekly workbook page all designed to coordinate with the lesson theme and aim. In an interactive CD-ROM format, In Step with the Master Teacher offers 22 hours of biblical, integrated teacher training sessions full of creative and practical ideas that can be used regardless of the location, size, or budget of any children’s ministry. Available now in more than 15 languages, it has been used for teacher-training to date on five continents as well as the Philippines and Caribbean islands. BCM’s newest children’s evangelism curriculum, Sharing Christ with Kids, published in a joint venture with Awana, Rorheim Institute, and Celebrate Kids, trains children’s ministry leaders and local churches to boldly and biblically share the gospel with kids.